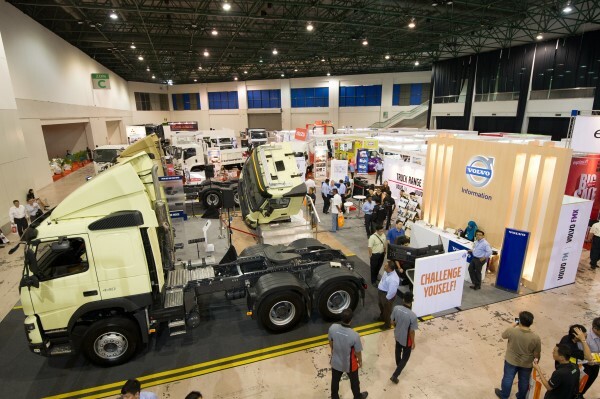 Previewed earlier in a regional launch in Korea, the Volvo FM and FMX; specifically built for customers in the growing long-haul transportation, distribution, construction and mining industries were launched by Volvo Trucks Malaysia last week. While the Volvo FM now has a lower weight, new axle configurations, increased chassis flexibility and crystal-clear interfaces that allow the customer to tailor the perfect truck for the job, the new FMX features a high-tensile steel cab, a redesigned front structure, and a new rear air suspension system. According to Volvo Trucks Malaysia, both the Volvo FM and FMX trucks can be equipped with Dynafleet, Volvo Trucks’ proprietary web-based tool and system that streamlines the planning and execution of fleet management for improved profitability. The Dynafleet Fuel and Environment feature utilizes telematics, allowing companies to follow up on fuel consumption over time, identifying driving habits and ascertain the cost saving potentials in favor of an increased profitability for Volvo Trucks’ customers. “With the all new Volvo FM and FMX, Volvo promises the highest levels of flexibility and transport efficiency that embodies best-in-class technology and innovation that will suit every logistical need. 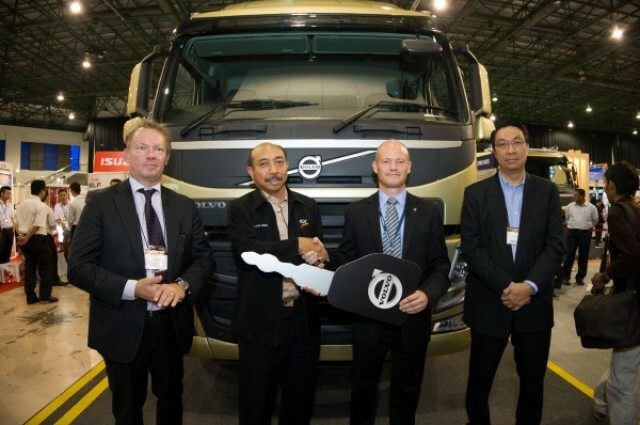 We truly believe that the top notch quality coupled with state-of-the-art innovation will provide unmatched experience and transportation solutions to our valued customers,” said Mats Nilsson, Managing Director of Volvo Malaysia. Taking place concurrently with the launch of Volvo’s new trucks range was handover ceremony to FELDA Transport, Volvo Trucks’ first Malaysian customer to receive the brand new Volvo FM. Isuzu Motors Limited and General Motors Company today signed a formal agreement to jointly develop a next-generation midsize pickup. Isuzu and GM previously developed two generations of pickups that have been popular in more than 100 countries around the world due to their strong performance, fuel efficiency and durability. The next-generation midsize pickup is expected to be sold in several major markets around the world. It will not be sold in the U.S. or Canada. Based on a long history of cooperation and trust, Isuzu and GM will leverage their extensive know-how and technologies to develop the next-generation midsize pickup to match customer needs. The joint team will also leverage synergies and commonize components to enable further reductions in cost. The project will strengthen the light commercial vehicle business of GM and Isuzu, whose pickup represents the basis for the new model. UD Trucks provides a glimpse of the Quester 8 Liter product range configured specially for Indonesia at the 22nd annual Indonesian International Motor Show (IIMS). Providing visitors of this year’s IIMS with a look into the future, UD Trucks displays the Quester 8 Liter 4×2 Rigid, 6×2 Rigid, 6×4 Rigid, and 6×4 Tractor, with red and white color cabins. The colors are no coincidence, these colors resemble the colors of Indonesia’s flag, reflecting UD Trucks’ theme for IIMS 2014, ’Quester for Indonesia’. 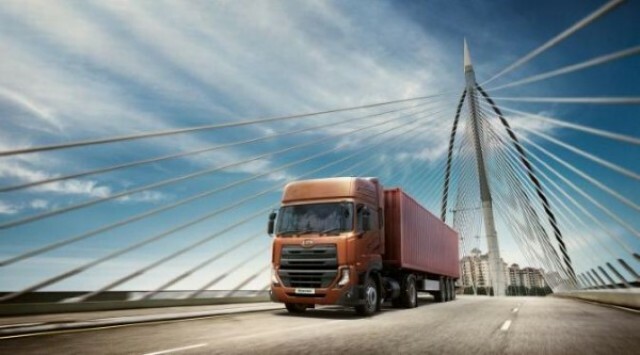 Back in 2013, UD Trucks had for the first time presented their new heavy-duty truck range Quester, targeting the truck markets in Asia and other fast growing regions in the world. This year in March, UD Trucks then started a journey to ’Go the Extra Mile for Indonesia’; reinforcing their commitment to Indonesia with plans to further expand the product offer. The Quester 8 Liter is giving proof of this continuous commitment. Announced for 2015, Quester 8 Liter will be specially configured to meet the demands of the Indonesia customer in the on-road segments. ”Quester, simply put, is the result of our passion to go the extra mile and today we are here to state that commitment to our customers in Indonesia. With the 8 Liter engine we are meeting a specific demand here in Indonesia, because there is a huge demand on-road applications conquering many road situations in Indonesia. Therefore I am confident that in future and with the complete Quester offer we will continue securing our strong position in the heavy duty truck market in Indonesia.” said Pierre Jean Verge Salamon, President Director of UD Trucks Indonesia. Quester is a truly real heavy-duty truck with a heavy duty 2.5m wide cab. 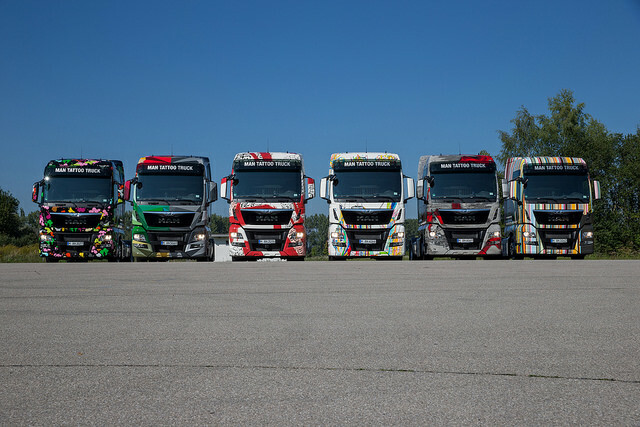 The truck’s heavy-duty chassis with high flexibility and quality is one of its main features, enabling it to provide options on chassis layouts to give a flexible packing arrangement including different wheelbases, a range of fuel tank sizes and different exhaust directions. With Quester, UD Trucks offers to the market the largest affordable Japanese heavy-duty commercial vehicle that allows customization to most transport requirements, while enabling excellent fuel consumption and high average speed. Developed with versatility in mind, Quester offers customers a unique experience of adaptability and affordability within its class that is currently unavailable in the market. “UD Trucks will be the first Japanese brand to offer a wide range of variants developed to meet the different needs of the Indonesian consumers and other growth markets with one common platform and at affordable prices,” says Pierre Jean Verge Salamon. 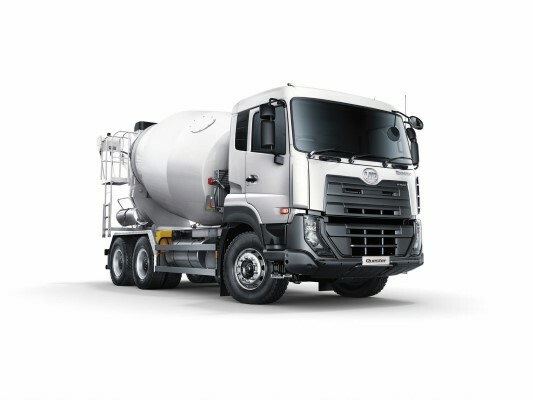 In addition to the new product offer, UD Trucks will also provide extensive customer service and support packages in 2015, supporting the new product range. 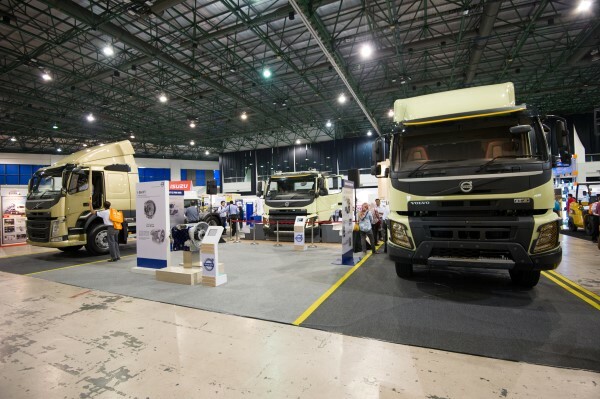 Strategically-located UD Trucks dealerships are preparing for offers to minimize operational costs, and maximize uptime, which will benefit many businesses in Indonesia. The Quester 8 liter range will be launched in the Indonesian market in 2015 and will be available through Astra International’s UD Trucks dealer network. 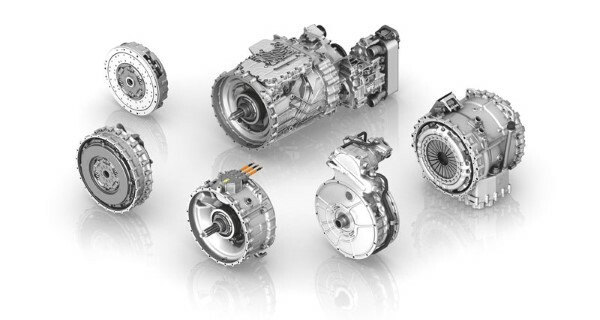 ZF’s innovations for driveline, chassis, and steering systems have always kept in mind the intelligent interplay between the three. This is because completely new functions can derive from the networking of individual systems, as is shown by the ZF Innovation Truck at its trade fair debut at the IAA 2014: The hybrid version of the TraXon automatic transmission system is combined with the Servotwin superimposed steering system and telematics solutions from Openmatics in this truck prototype. In this way, the truck,which is more than 25 meters long incl. 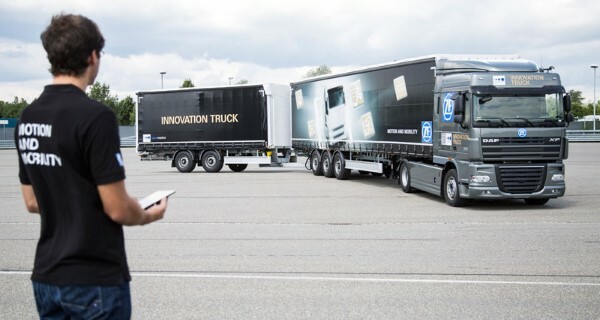 semitrailer and trailer, can be remotely maneuvered conveniently and safely using a tablet – and it is locally emission-free because only the electric motor in the hybrid system is active during the process. Just how important such assistance functions could be in future generations of vehicles is underlined in FERNFAHRER, ZF’s study on the future of transport – a study the technology company will discuss with partners in Hanover. One of the conclusions of the study is that the logistics sector will undergo greater industrialization in the future. In the light of the already noticeable shortage of drivers, truckers will in future concentrate more on the actual activity of driving. The loading and unloading on the ramp must then be separated from the actual driving activities. Volvo Buses is taking the next step in electrification with the launch of the Volvo 7900 Electric Hybrid. 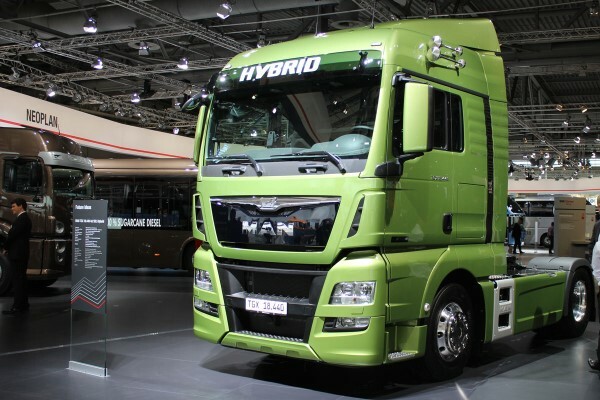 Its plug-in technology reduces fuel consumption and carbon dioxide by up to 75%, compared to a conventional diesel bus. Total energy consumption is reduced by 60%. “I am very proud to launch this ground-breaking bus system. Electric-hybrid buses and full-electric buses are tomorrow’s solution for urban public transport. 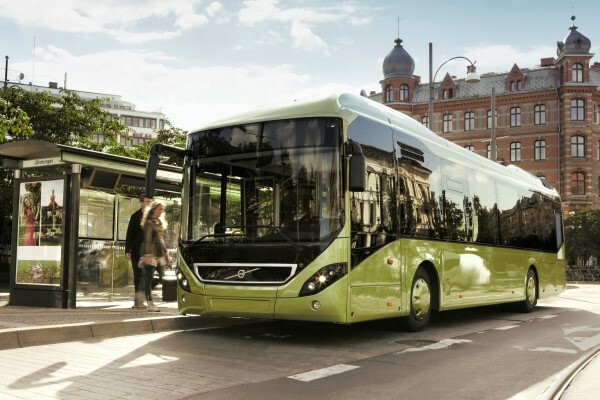 They will allow us to reduce energy consumption, air pollution, climate impact and noise, which are some of the biggest challenges facing large cities worldwide,” said Håkan Agnevall, President Volvo Bus Corporation. Noise is a growing problem in many cities. The noise level near to a Volvo Electric Hybrid is in the range of normal conversation level. The Volvo 7900 Electric Hybrid runs in electric mode on average 70% of the route, silent and emission-free. 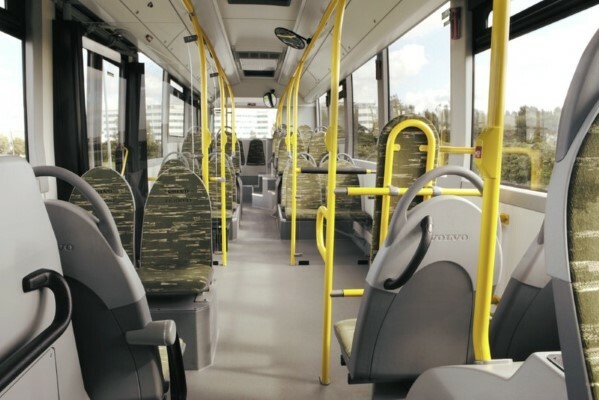 The Volvo 7900 Electric Hybrid offers great flexibility in operation; it can run as an electric bus in selected areas, but performs as a hybrid on any route. Charging at end stations takes 6 minutes. The Volvo 7900 Electric Hybrid shares the technology of the well-proven Volvo 7900 Hybrid, securing high uptime and availability. A number of European cities are showing a keen interest in Volvo’s Electric Hybrids. Hamburg, Luxembourg and Stockholm will implement the new bus system in 2014 and 2015. Series production is scheduled to start in early 2016. Three Volvo Electric Hybrids have run in a field test in Gothenburg over the past year, a test that has verified the reduction in energy consumption and emissions. As of this autumn and for two years ahead, eight Volvo Electric Hybrids will be put into regular operation in central Stockholm. This is part of ZeEUS, an EU project being conducted in six European countries. The bus is charged quickly at charging stations via an overhead power connection. Recharging takes appr.6 minutes at end stations. 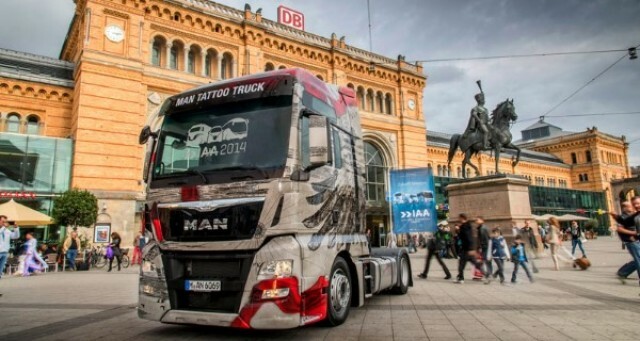 MAN has started the IAA Commercial Vehicles Motor Show 2014 with a world premiere: six “MAN Tattoo Trucks” that were unveiled in front of Hanover Central Station. The idea behind it was to find the person who interpreted song texts from Peter Maffay’s new album “Wenn das so ist” [If that is so] in the most fascinating way on a truck in terms of form and color. Multifunctional like a Swiss Army knife. 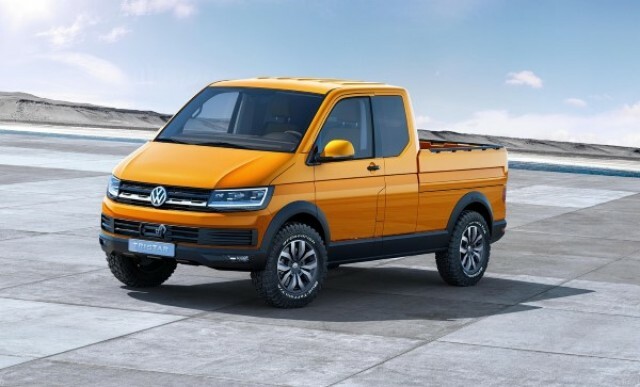 Variable, reliable and an all-rounder: on the occasion of the 30th anniversary of the first Syncro concept car, Volkswagen Commercial Vehicles presents the TRISTAR, an unprecedented combination of all the good features of the current T model series. Its extreme off-road capability combined with flexible transport and storage capacities make the Tristar the perfect service, transport or surf mobile, at your choice. Transporter of the future. 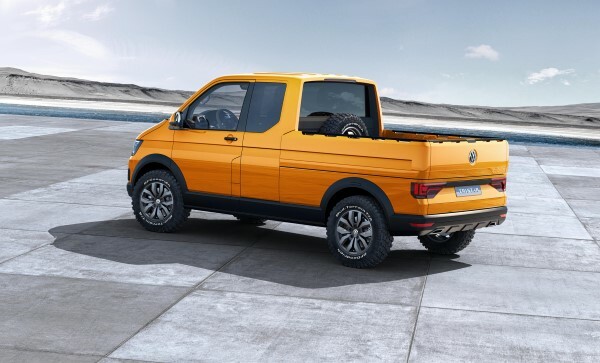 On the occasion of this year’s IAA, Volkswagen Commercial Vehicles presents a concept vehicle with the legendary name of Tristar. The beefy pick-up with extended cab, styling bar and short wheelbase has a permanent four-wheel drive with mechanical rear axle differential lock and 30 mm additional ground clearance. Fitting its name, the designers have developed a high-precision, new and yet familiar design language: the sharp, wrap-around lines, LED headlights and a changed architecture of the whole front give the concept car a powerful and wide appearance. The monolithic dashboard is reminiscent in its shape and simple functionality of the earlier models of the VW Transporter. The load can be distributed on two separate levels: there is a spacious, dust-proof and watertight drawer under the flatbed section, where a deep-tread spare tire is also housed. The interior has a 20-inch tablet table and state-of-the-art video conferencing and sound systems alongside the turnable and slidable driver and passenger seats, turning the TRISTAR into the perfect place for meetings. We even thought of having an espresso machine installed. All-rounder for specialists. Its extreme off-road capability in combination with flexible transport and storage capacities make the TRISTAR into a mobile workshop, a mobile high-tech office or into a perfect surf mobile. Safe, high- quality and flexible, the new Volkswagen TRISTAR is a versatile tool for every user. Whether an architect, a film crew, service expert, landscape gardener or an expedition participant. Scania is starting extensive cooperation with MAN regarding gearboxes for heavy commercial vehicles. MAN will gradually introduce Scania´s current gearbox range from 2016 and the companies will cooperate on future generations. This will mean faster delivery of improved products to customers, as well as more efficient use of production units and research and development resources. 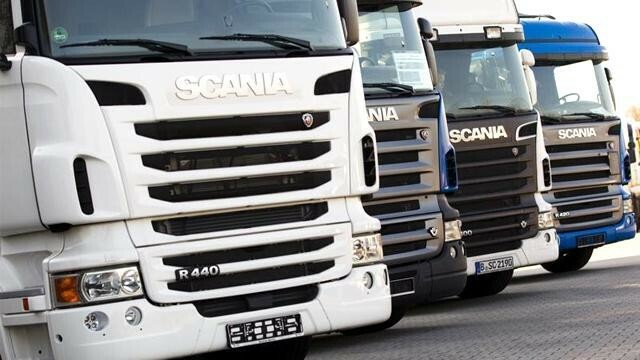 The cooperation relates to Scania´s current gearbox range and the development of future generations. Scania gearboxes will be gradually introduced in MAN´s products starting in 2016. MAN will integrate the gearboxes in its powertrain and electronic architecture. This is a milestone in our cooperation with MAN. By using common components which are not that brand-specific, we will strengthen our offering to customers. At the same time, we will achieve significant synergies in the longer term, says Martin Lundstedt, President and CEO of Scania. Even though there will be some common components in the powertrain, what is of critical importance for the vehicle characteristics is the strategic software that controls the gearbox and how it performs with the other powertrain components. Therefore, each brand will develop its own strategic software, among other things. For our customers, vehicle uptime and fuel economy are paramount considerations and we will continue to develop brand-unique solutions that contribute to improvements in these areas, emphasises Martin Lundstedt. The gearbox cooperation will generate significant synergies, through higher production and purchasing volume and greater resources within research and development, among other things. Ford is revealing the full line-up of its all-new Transit model at the 2014 Hannover Commercial Vehicle Show, providing European customers with an extended choice of more than 450 model variants. Transit derivatives now in production and available from Transit Centres and Ford dealerships across Europe include Chassis Cab with Double Cab and extra-long “Super Jumbo” versions, Double Cab-in-Van, Kombi and Kombi Van models. These new Transit variants mark the completion of the unprecedented 24-month renewal and expansion of Ford’s entire Transit commercial vehicle range for Europe, creating the freshest model line-up in the industry. Ford’s Hannover display showcases the full range, with the two-tonne Transit flagship alongside the one-tonne Transit Custom, the smaller Transit Connect van with payloads up to 1,000 kg, and the small Transit Courier van for small businesses and urban deliveries. The model renewal has allowed Ford to become Europe’s fastest growing commercial vehicle brand, selling more than 137,000 commercial vehicles from January to August 2014 to show a 12.7 per cent year-over-year increase compared with 2013. 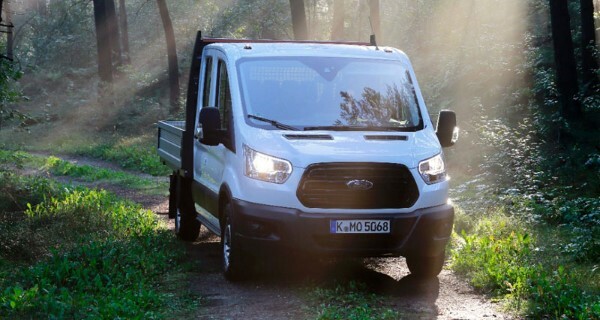 During the same period, sales of the Transit Custom more than doubled, sales of the Transit Connect grew by 59 per cent, and Ford’s share of the commercial vehicle market rose to 10.8 per cent – Ford’s highest level since 1997*. Ford also has launched the Transit24 service package through its network of 750 Transit Centres across Europe, setting consistent new dealer service standards that will enable van users to reduce the time their vehicle spends off the road and minimise their operating costs. The first phase of all-new Transit production launched in spring 2014, and included the standard Van, Chassis Cab and Minibus versions. The line-up offers customers enhanced fuel efficiency – including an extended choice of Transit ECOnetic models – with significantly reduced maintenance and repair costs, exceptional durability, increased cargo volumes, and smart loadspace features. Ford’s manufacturing plant in Kocaeli, Turkey, is now producing a second wave of additional variants that offers new body styles and chassis lengths, and will shortly include a class-leading all-wheel drive (AWD) range.